A brief history of chairs. Still from Lawrence of Arabia. There is a pivotal early scene in David Lean’s film Lawrence of Arabia in which T. E. Lawrence and his superior, Colonel Brighton, visit the desert encampment of Prince Faisal, a leader of the Arab Revolt. The royal tent is spartan yet luxurious, patterned woven cloths hang from the low ceiling, a large brass samovar gleams in the candlelight, the ground is covered with a rich carpet. There is no furniture; the men sit on the carpet. Brighton, in his tailored uniform, polished Sam Browne belt, and riding boots, looks distinctly ill at ease with his legs awkwardly stretched out in front of him. Lawrence, a lieutenant and less formally dressed, appears slightly more comfortable, with his legs folded to one side. 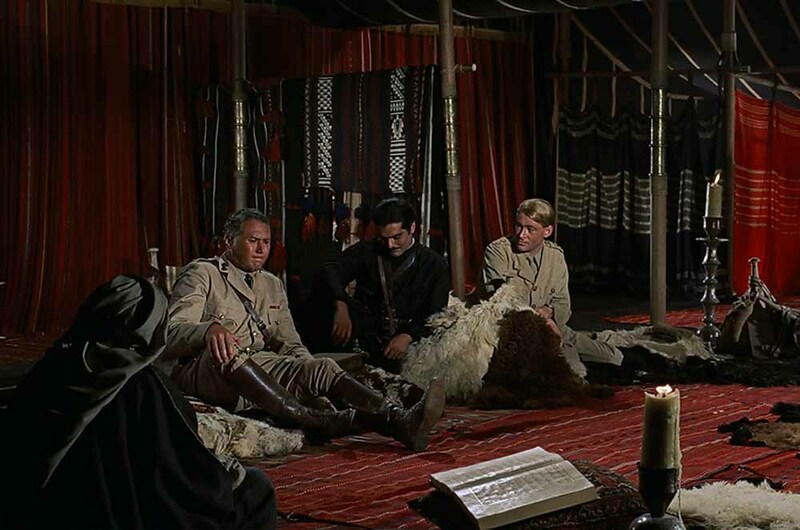 The prince, attired in a dark robe and a white ghutrah, reclines on a pile of sheepskins, while his colleague Sherif Ali leans casually against a tent pole. The various postures cinematically underline a central point: the relaxed Bedouins are at home in this place—the desert—while the stiff English colonel is an interloper. Lawrence is somewhere in between. The world is divided into people who sit on the floor and those who sit on chairs. In a classic study of human posture around the world, the anthropologist Gordon W. Hewes identified no fewer than a hundred common sitting positions. “At least a fourth of mankind habitually takes the load off its feet by crouching in a deep squat, both at rest and at work,” he observed. Deep squatting is favored by people in Southeast Asia, Africa, and Latin America, but sitting cross-legged on the floor is almost as common. Many South Asians cook, dine, work, and relax in that position. Certain Native American tribes in the Southwest, as well as Melanesians, customarily sit on the floor with legs stretched straight out or crossed at the ankles. Sitting with the legs folded to one side—Lawrence’s position above—is described by Hewes as a predominantly female posture in many tribal societies. The diversity of different postures around the world could be caused by differences in climate, dress, or lifestyle. Cold or damp floors would discourage kneeling and squatting and might lead people to seek raised alternatives; tight clothing would tend to inhibit deep squatting and cross-legged sitting; nomadic peoples would be less likely to use furniture than urban societies; and so on. But cause and effect does not explain why folding stools originated in ancient Egypt, a region with a warm, dry climate. Or why the Japanese and Koreans, who have cold winters, both traditionally sat on floor mats. Or why the nomadic Mongols traveled with collapsible furniture, while the equally nomadic Bedouins did not. Hewes explained that he did not include the reclining position in his research because he did not find sufficient photographic evidence. That is a shame because reclining has always been a comfortable position for the body at rest. The ancient Egyptians used beds, and may have reclined on couches, although these do not appear in wall paintings—banquet scenes show people on chairs or sitting on the ground. The earliest pictorial evidence of dining in a reclined position is a seventh-century B.C. bas-relief in the British Museum. The alabaster carving sometimes called The Garden Party shows an Assyrian king and his wife being served food and drink outdoors—they are celebrating a victorious battle. 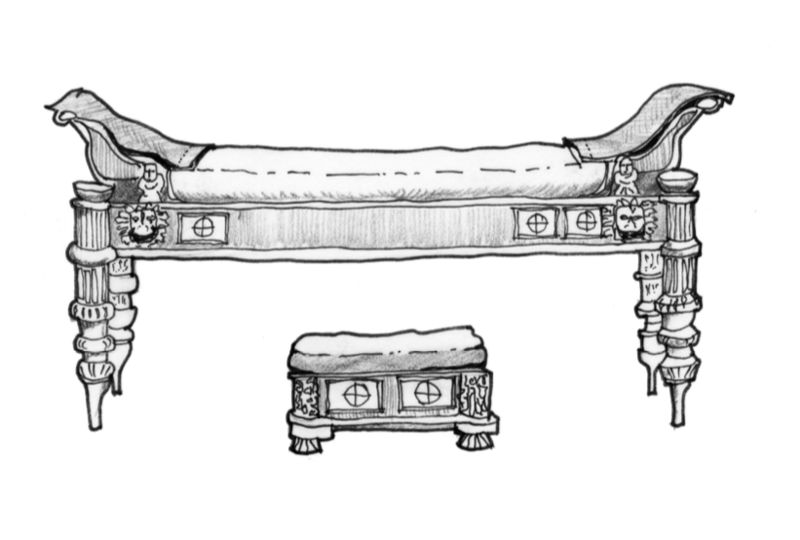 The king is reclining on a couch that resembles a chaise longue, while the queen is seated nearby in an armchair; they share a table laden with food. What is unusual about the furniture is that it is very tall: the couch is about five feet off the ground, and the queen’s armchair, which reminds me of a lifeguard’s chair, is waist-high and requires a footstool. The reason for this height is to elevate the sitters above the servants, who wield fly whisks with handles as long as broomsticks to fan the royal couple. A ghoulish detail: the head of the king’s vanquished enemy hangs from a nearby tree. Roman Couch. All drawings by Witold Rybczynski. The Austrian architect Bernard Rudofsky is best remembered for a series of provocative books, including Architecture Without Architects, based on a 1964 exhibition at the Museum of Modern Art, where he was a curator. Something of a design gadfly, he applauded the custom of prone dining. He observed that Roman diners, with but one hand free, had no use for cutlery, thus doing away with what he called table clutter. A cheerful iconoclast, Rudofsky despised the functional modern bathroom, for example, and disliked most domestic labor-saving devices. He particularly ridiculed chairs. “The more sensitive among us are aware of the ludicrous aspects of sitting on chairs—impaled on four toothpicks, as it were, or, draped limp like an oyster, over what resembles an outsized halfshell.” Rudofsky’s rather strained description was a calculated challenge to those who considered chair sitting to be culturally superior to floor sitting. He was certainly correct that the lack of chairs is not a sign of either primitiveness or ignorance. The refined Japanese and Koreans were long aware of sitting furniture, but chose to sit on floor mats instead. In India, upright sitting was introduced more than two centuries ago by the British, yet most people still perform a variety of tasks—cooking, eating, working—while seated cross-legged on the floor. Selecting one sitting posture over another has far-reaching consequences. If you sit on floor mats, you are likely to develop an etiquette that requires removing footwear before entering the home. You are also more likely to wear sandals or slippers rather than laced-up shoes, and loose clothing that enables you to squat or sit cross-legged. Floor-sitters tend not to use tall wardrobes—it is more convenient to store things in chests and low cabinets closer to floor level. People who sit on mats are more likely to sleep on mats, too, just as chair sitters are more likely to sleep in beds. (India, where many people who sit on the floor use beds, is an exception.) Chair-sitting societies develop a variety of furniture such as dining tables, dressing tables, coffee tables, desks, and sideboards. Sitting on the floor also affects architecture: walking around the house in bare feet or socks demands smooth floors—no splinters—preferably warm wood rather than stone; places to sit are likely to be covered with soft mats or woven carpets; tall windowsills and very tall ceilings hold less appeal. Any culture that decides to sit on chairs must come to terms with a challenging reality: human posture. The first person to recognize the connection between sitting and posture was the eighteenth-century French physician Nicolas Andry de Boisregard. Andry was a pioneer in the field of orthopedics—he coined the term—and in his 1741 treatise he described the connection between healthy sitting posture and chairs. “When one sits with the body bended backwards, the back must necessarily be crooked inwards,” he wrote, “and when one sits upon a hollow seat, the effort which one naturally makes, and without any design, to bring the body to an equilibrium, must of necessity make the back still more crooked.” The hollow seat referred to the concave woven rush seats of ordinary chairs, which tended to sag over time. To improve posture, Andry proposed adding an adjustable screw that would push up on the seat from beneath, keeping it flat. Posture is a distinct problem to humans because the skeleton is fundamentally unstable in the upright position. A four- or even a three-legged chair or stool can be quite stable. But who ever heard of a two-legged piece of furniture? The two-legged human body presents a continuous problem in maintaining balance, a problem augmented because the feet are a very small base of support for a towering superstructure. And as though this were not problem enough, the trunk, head, and arms are supported from the hips upward by a one-legged arrangement of the spine. The purpose of the chair is to provide respite from this precarious balancing act. But the instability that Kelly describes is, if anything, compounded when one sits down. The weight of the body is concentrated on the ischial tuberosities, or sitting bones, at the base of the pelvis. These bones, which resemble the rockers of a rocking chair, provide support only laterally and allow the body to rock back and forth in the other direction. A chairback provides the support that allows the muscles to relax, but a too-vertical backrest causes the sitter to slump, while simply angling the chairback creates an unnatural backward leaning posture. If the seat is too hard, it will cause discomfort to the sitting bones, and if it is too soft it will distort the buttock muscles and will press on the ischia, likewise causing discomfort. 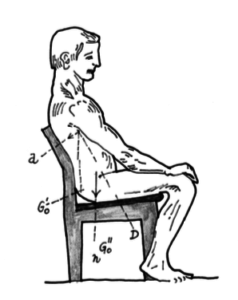 If a chair is too low, the body’s weight will all be concentrated on the sitting bones instead of being carried by the thighs; if a chair is too high, the sitter will tend to slump forward to place the feet in a more stable position on the floor, but this will constrict breathing and create muscle tension in the neck. In 1884, a German orthopedic surgeon, Franz Staffel, judging that most chairs were “constructed more for the eye than for the back,” proposed a low backrest that supported the lumbar region. Staffel, who has been called the “father of the modern school chair,” recommended that when sitting, the back should approximate as closely as possible the double-S curve of the spine when standing upright. During the nineteenth century, when primary education became obligatory and children spent more and more time sitting in the classroom, researchers proposed a variety of chair-desk combinations intended to improve posture. Some of the designs included seat belts, forehead restraints, and face rests, although it is hard to imagine that such Draconian devices were ever actually used. Chair with lumbar support (after Hans Strasser). The movement of standing up and sitting down is also a challenge. We have all experienced the rude jolt when we miscalculate the height of a chair, because dropping into a chair briefly exerts twice our body weight on the spine. The design solution to this problem is the armrest, which provides something to hold on to as we lower ourselves into the seat and is also a handy place to push up from as we rise. This is especially important if a chair is low, like a lounge chair. Getting up from a low chair without arms can be difficult, especially for the elderly. Armrests serve another purpose: relieving some of the stress from the shoulders by providing something on which to lean while we are sitting. The British psychologist Paul Branton described the seated body as “not merely an inert bag of bones, dumped for a time in a seat, but a live organism in a dynamic state of continuous activity.” We don’t sit still—we fidget, we shift our weight, even if ever so slightly, crossing our legs and arms, moving our cramped muscles. We interact with our chairs: we sit on them, lean back and lean forward, and often perch on the edge of our seats. We wrap our leg around our chair’s leg; we sling one arm across its back, or a leg across its arm. We are good at walking and running, and we are happy lying down when we sleep. It is the in-between position that is the problem. This is true even if we sit on the ground—as attested by the variety of pads, bolsters, armrests, and cushions used by floor-sitting cultures. It is even truer when we choose to sit on a chair. Every chair represents a struggle to resolve the conflict between gravity and the human anatomy. Sitting up is always a challenge. Excerpted from Now I Sit Me Down: From Klismos to Plastic Chair: A Natural History by Witold Rybczynski. Published by Farrar, Straus and Giroux, LLC. Copyright © 2016 by Witold Rybczynski. All rights reserved. Witold Rybczynski is an emeritus professor of architecture at the University of Pennsylvania. His book Now I Sit Me Down is available from Farrar, Straus and Giroux.